I have a 1 TB internal drive (with APFS file system and FileVault enabled) I want to backup using Time Machine to an external USB hard drive. I want the backup itself encrypted so no one who has the hard drive can read/restore its content without a password. Should I format the Time Machine partition as APFS or APFS (encrypted)? Should I select "Encrypt backups" option when creating the Time Machine or should I even do both? I called Apple and they told me to do both but the call center agent did not really make the impression that he knows for sure. The simplest setup is to just connect any disk to the Mac and if you don't have Time Machine set up, you will be automatically prompted to use that drive and if it needs reformatting, that is explained. 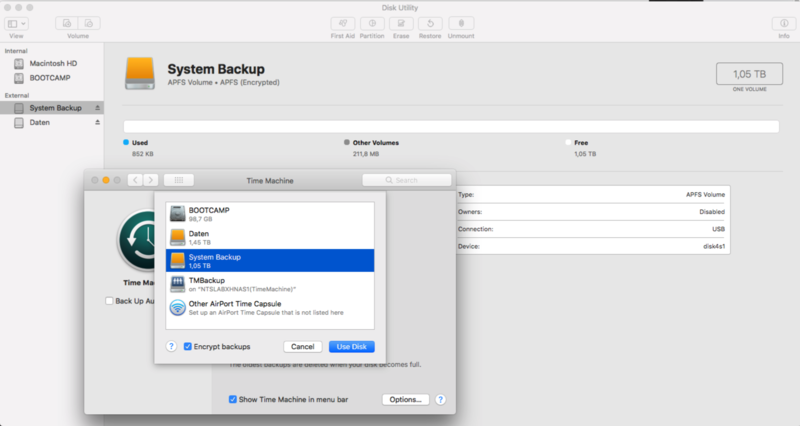 Then once the backups are set, if you are backing up an encrypted Mac to an unencrypted destination, Time Machine automatically prompts to encrypt the drive. If you like doing things manually, here's more details and explanation that you want an HFS based drive to hold the backup whether you start from APFS or HFS. Not the answer you're looking for? Browse other questions tagged hard-drive backup time-machine filevault encryption . Encrypt Time Machine backups without deleting old backups?